In order to try out the new “Raiders” supplement for Dux Britanniarum I picked up at Salute, I decided to run a new campaign using the Picts. Although this meant I wouldn’t get to use my Irish Lord in a chariot, it also meant I wasn’t straight in at the deep end with the newer rules for cavalry and commanded skirmishers. The year is 480 A.D. and Galan, a 20 year old Pictish warlord, accompanied by his champion Drest and loyal (but lustful) 34 year old noble retainer Talorg have decided that a church in Alt Clut, the northernmost of the British kingdoms, needs relieving of its wealth. Galan has already earned the nickname of “the Insane” so a lot of his fellow Picts were probably relieved to see him heading south to seek his fortune and they were also probably the reason why a British force was alerted to the raid and stood waiting near the church. Erbin the Unlucky, the 21 year old son of a British Warlord stood back from the church with his hastily-assembled force of infantry. His father had sent his loyal champion Caw to watch the boy’s back, along with two of his trusted retainers, Dumgal and Cinuit to remind the levy who they owed their loyalty to. 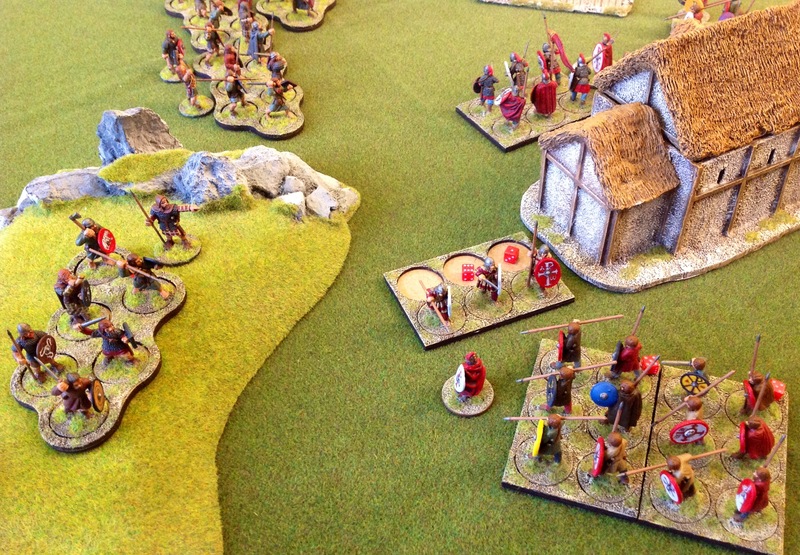 Erbin lived up to his Unlucky title right away, rolling badly for force morale so the British stood at 6 while the Picts stood at 8. British Noble Dumgal was in reserve with the 3 units of Levy, while the unit of 6 elite Warriors and 2 units of 6 Warriors stood by the church with their Lord, Champion and other Noble, ready to give the Picts a warm welcome. The Pict plan was pretty simple – cavalry were sent around the left flank, skirmishers and missile troops down the right while the main body of Raiders accompanied by the Galen and Drest ran straight down the middle straight for the church. 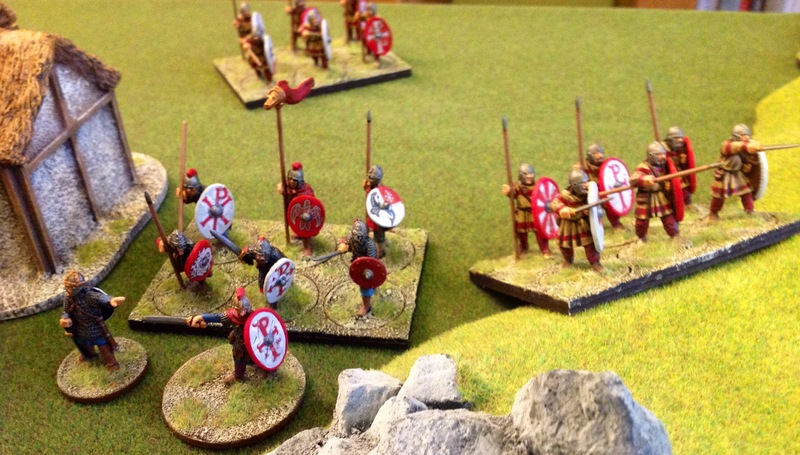 A small force of 6 Raiders along with Talorg (the other Pict Noble) would help the Pict skirmishers contest the hill. The race was on to occupy the hill overlooking the church, with 1 unit of British Warriors beating the Pict skirmishers to the top, but then having to suffer shock and losses over successive turns as crossbow bolts and javelins were heaved in their direction. Their own slingers were ineffective in comparison. 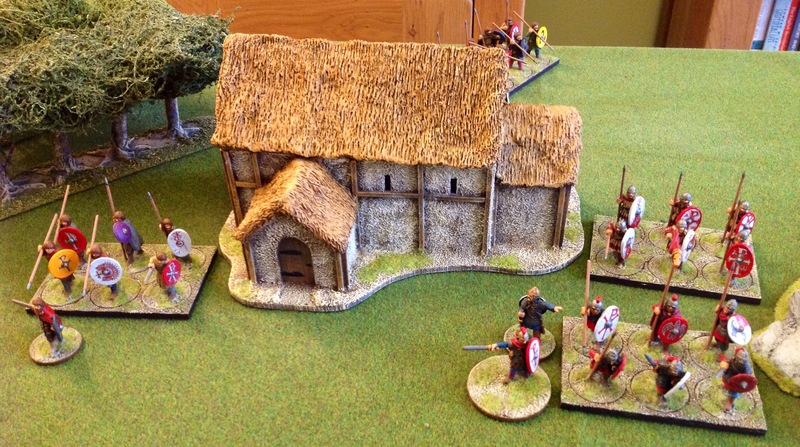 By the end of turn 2, the British warriors were positioned in front of the church (but in their haste they had not adopted any formation) and their Levy were following on, whereas the Picts, seeing their way to the church blocked, paused for breath (drew some Fate cards in other words) and ranked up. The young British Warlord took the bait, ordering a unit of Warriors in against the cavalry – the Pict cavalry went to evade, but the play of a Carpe Diem card put a stop to that. 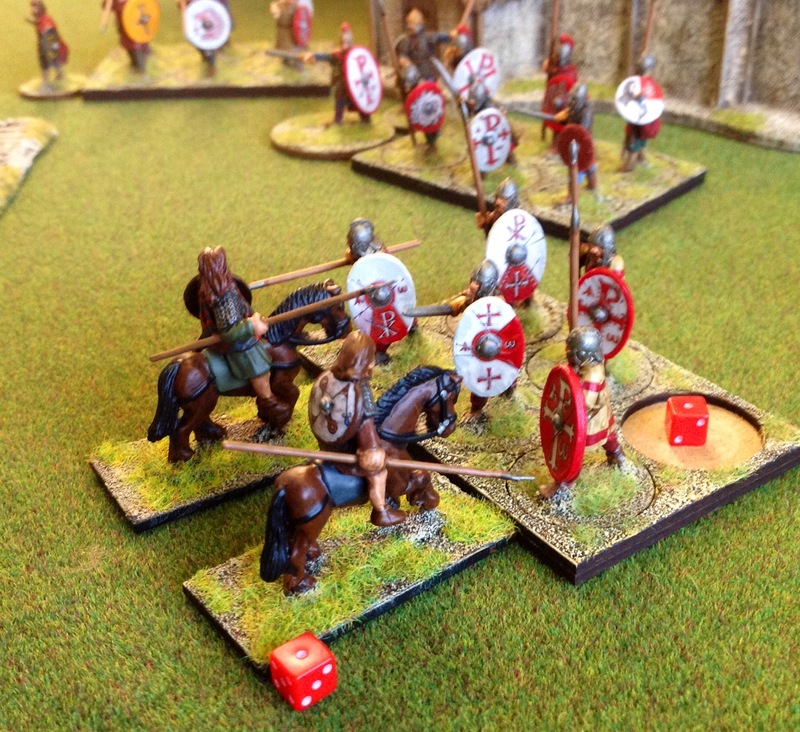 However with the Picts counting as Warriors and neither side having any combat cards to play, it was 6 British dice against 4 Pict dice in the ensuing melee. Whoever gave the British Warlord the title of “Unlucky” got it totally wrong, as in the first round of the fight the British killed 2 Pict cavalry for the loss of 1 of their own, but both sides rolled badly in the second round, took 1 shock each and so stood locked in combat. Seizing his chance (his card came up next), the Pict Lord played a “Bounding Move” card which allowed his formation to crash into the flank of the frontally engaged British Warriors. The fight was hard fought and though they managed to take another cavalry man with them, the group of British Warriors lost 2 more dead and took enough shock to rout them from the field, so they ran taking 2 force morale with them. Then Talorg, the other Pict noble, was activated, charging the Warriors on the hill but augmenting his Noble level to 4 by the play of an “Audacia” card. The British responded by playing “Strong Arm” which allowed them to shower the advancing Picts with close-quarter missiles, but to no avail (only 1 shock was caused) – this was an incorrect use of the card as it is a suited card and can only be played by a Noble – thanks to Willie for pointing this out. 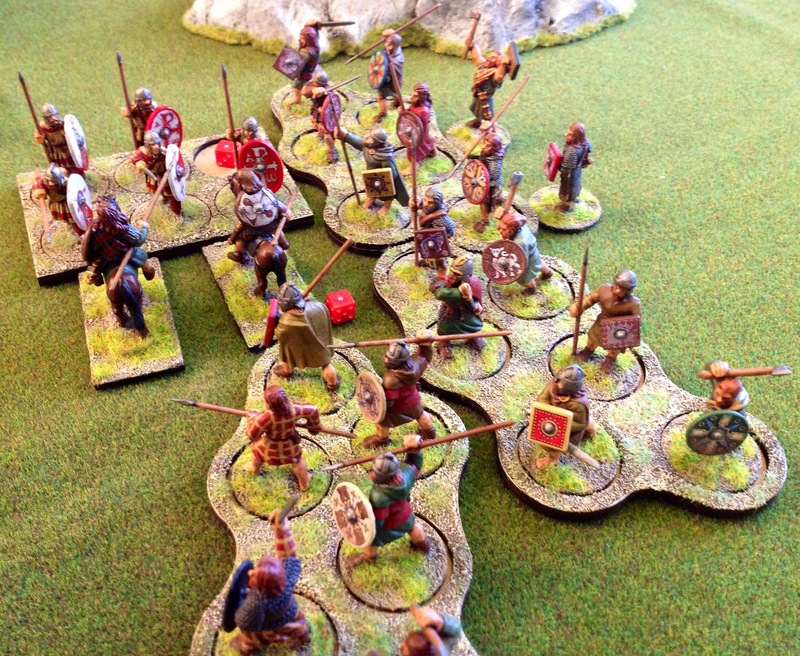 The Picts rolled 10 dice, killing 2 British Warriors and causing 1 shock, while the British response was a miserable 1 shock. 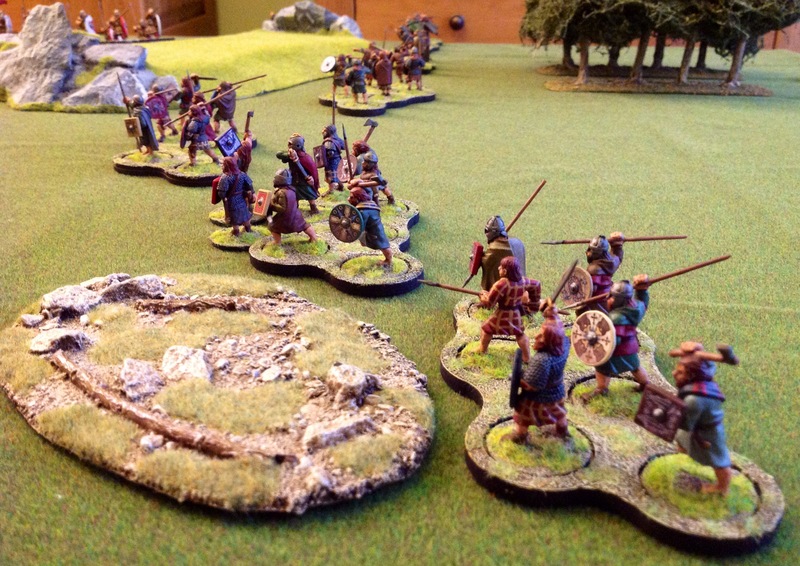 The Warriors were forced back 2″ – the Picts followed up decisively, causing 2 more dead and 2 shock. Having already been reduced in numbers and shocked by Pict missile fire, the 1 remaining Warrior had had enough and routed from the field, but burst through 2 units of Levy to do so, putting shock on each. This, combined with the other retreating Warriors bursting through the same Levy (as it was now the end of the turn) took the Levy’s shock to double their numbers, meaning they had to rout. The British Army morale was now down to 0, so Erbin the Unlucky had to quit the field – Galan the Insane seeing his way to the church open let the British go with only a token pursuit. In the post game sequence, the British came out badly, needing 2 months to replace their losses, while the Picts only needed 1 month – this meant that the Picts could raid unmolested for the month of April. 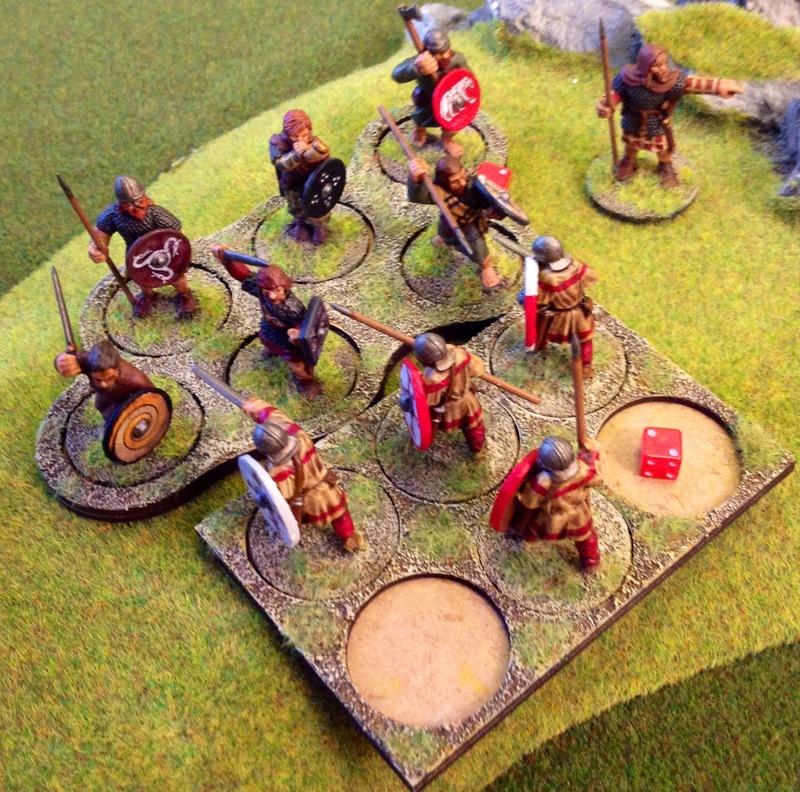 Added to that they gained 4 Raiders to their warband, attracted no doubt by the easy pickings to be had in April. This left the Picts with 2 Thief’s Hordes of loot to add to their starting Thief’s Horde (6 wealth in game terms) but without Honour, which a Pict Warlord also needs to get ahead in life and can only gain by being wounded in battle. The new rules added by Raiders are fairly easy to pick up. When I had to refer to the Lardy Forum and Yahoo group it was to do with Nobles and cavalry – turns out that mounted Nobles assigned to lead cavalry can only rally shock from them or draw a card. They can’t use their Noble card to move the cavalry – this movement is done on a new Cavalry card added to the deck by the supplement and this card activates all cavalry in a force. 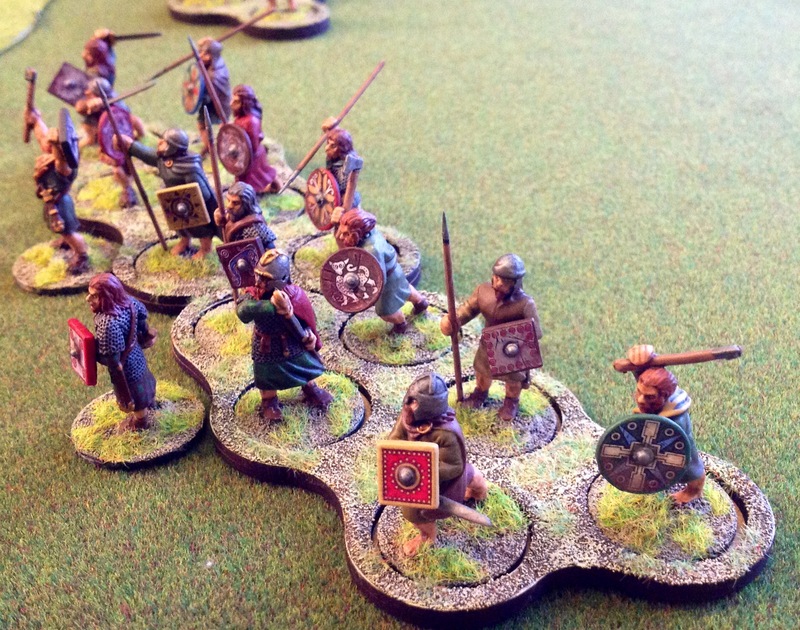 The supplement has been promised for a long time, though this has given me time to paint up a sizeable band of Scots, Irish and Picts even with my glacial painting speed. The book and cards are beautifully presented and packed to the brim with ideas and a bargain at £18 – if you own Dux Britanniarum I would see this supplement as a must-have. Highly recommended! 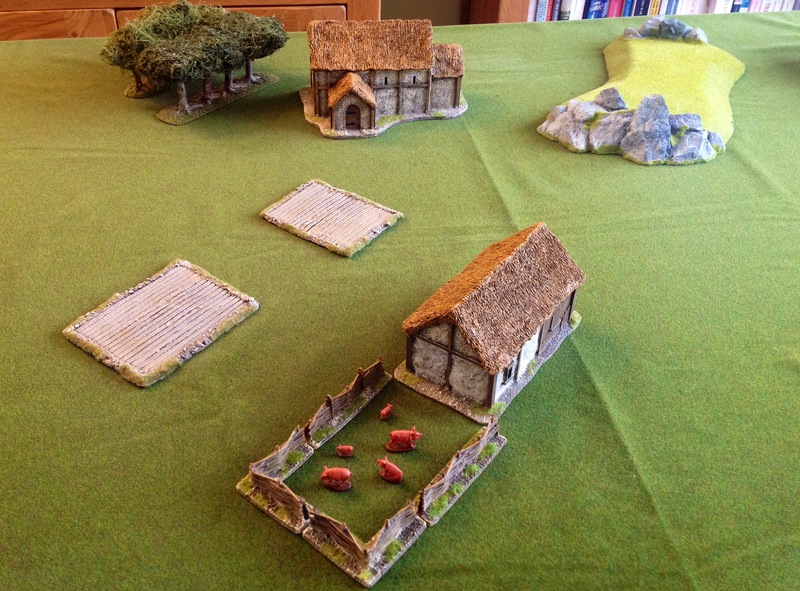 This entry was posted in Dark Ages, Dux Britanniarum. Bookmark the permalink. Excellent AAR Norman! Those raiders are indeed great fun. Two small points however. Normally the defending party can’t use the ‘Strong Arm’ card. Since it carries a move reduction it’s meant only for an attacking group I believe. Secondly, Nobles with cavalry can still ‘buy’ a card aside from rallying their men. They can also join different cavalry groups into a formation. Only difference is that the cavalry moves( and attacks) on the cavalry card. Even then they can still play a support card like for example aggressive charge or even multiple cards if playing a Carpe Diem card first. And please keep those AAR’s coming! Hi Norman Some super looking figures and very nice terrain pieces.